Push-ups are more effective if you use a suspension trainer: we wrote about this recently. But there are dozens of suspension trainers on the market. So which is the best? Sports scientists at the University of Valencia in Spain published the results of a study in which they set out to answer this question. If you do body weight exercises with a suspension trainer you make yourself more unstable - and that makes the exercise more effective. If push-ups are no longer a challenge for you, then suspension trainers make push-ups into an exercise that can help you build more strength and possibly muscle mass too. 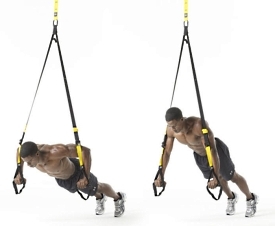 The Spaniards got 29 fit students to do push-ups in the traditional way [Floor] and using four different suspension trainers: the TRX Suspension Trainer, the Flying, the AirFit Trainer Pro [the one shown above] and the Jungle Gym XT. On paper the AirFit Trainer Pro is the most interesting of the four. It has a spring, which creates extra instability. The figure below shows the differences between the trainers. Click on the figure for a larger version. The researchers attached electrodes to the participants' muscles so that they could measure how hard the muscles had to work. They discovered that the AirFit Trainer Pro provided the most intensive stimulus to the most muscle groups. The other systems all produced comparable results. Push-ups done with the AirFit Trainer Pro gave the biggest stimulus to the lower back muscle [erector spinae], the quadriceps [more precisely, the rectus femoris], the rectus abdominis six-pack muscles, the trapezius and the triceps. For the shoulder muscle deltoidus anterior old-fashioned push-ups turned out to be the best exercise. If it's your pecs you're looking to develop, the researchers say you're best off with the Jungle Gym XT. 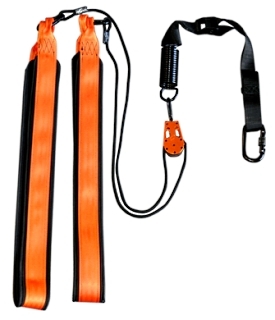 The researchers were not paid by a manufacturer of suspension trainers. J Sports Sci Med. 2014 Sep 1;13(3):502-10.